With the Pokemon Go anniversary events well under way, gyms are being temporarily disabled to make room for a “major facelift.” Gyms will soon see badges and co-operative raid battles. These updates will start with the refresh to gyms. Each gym will no longer rely on prestige and training—instead, there will be six slots for the controlling team’s Pokemon, and only one of each kind of Pokemon can be assigned there. Gyms will also receive spinning photo discs that dispense different goods, like PokeStops. Additionally, gym battles will rely on motivation. Pokemon that are assigned to defend a gym will lose motivation as they are defeated in battle, and once they lose all motivation, they will be easier to defeat. But never fear, that’s what berries are for: Keep morale high by feeding your team’s pocket monsters berries. As you progress through gyms across the world, you’ll also be able to start collecting gym badges. These can be leveled up to show off your dream team and receive extra rewards from the photo discs at your gym. Level up your badges by battling, giving berries and spinning the photo disc. 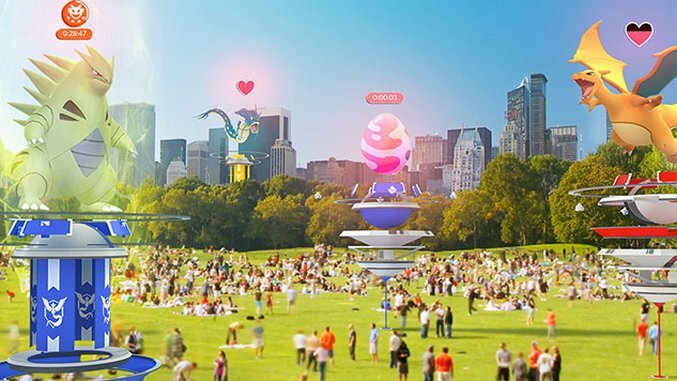 Co-op play is finally coming in the form of gym raid battles. These 20-player battles will pit you against a powerful raid boss in five-minute long battles to the death. Once a day, you’ll be able to receive a raid pass, and can only hold one at a time. These raid passes are your key to battle when you see a large egg on top of a gym. Defeating the boss means a chance to catch a powerful Pokemon, and exclusive items like rare candies, golden razz berries and a fast attack or charged attack technical machine. Niantic has yet to announce when these updates will go live, but it’s estimated to be within a few weeks. At this point, all gyms have been disabled, and the new features will start going into beta soon. Find out more here.